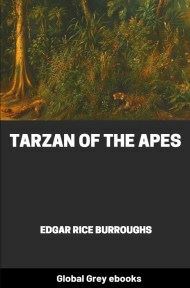 This is the sixteenth book in the Tarzan Series. After encountering and befriending Valthor, a warrior of the lost city of Athne (whom he rescues from a group of bandits known as shiftas), the City of Ivory and capital of the land of Thenar, Tarzan is captured by the insane yet beautiful queen Nemone of its hereditary enemy, Cathne, the City of Gold, capital of the land of Onthar. 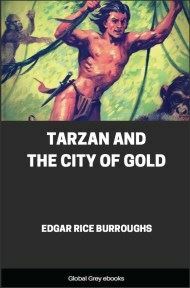 This novel is perhaps best known for two scenes; in the first, Tarzan is forced to fight Cathne's strongest man Phobeg in its arena. While an ordinary man might have been in trouble, Tarzan easily overpowers Phobeg. The second scene, in which Tarzan is forced to fight a lion, starts with the ape man being forced to run away from a hunting lion, Belthar, which will hunt him down and kill him. Tarzan at first believes he can outrun the beast. This lion, however, is of a breed specifically selected for endurance, and ultimately Tarzan must turn to face him. DOWN out of Tigre and Amhara upon Gojam and Shoa and Kaffa come the rains from June to September, carrying silt and prosperity from Abyssinia to the eastern Sudan and to Egypt, bringing muddy trails and swollen rivers and death and prosperity to Abyssinia. Of these gifts of the rains, only the muddy trails and the swollen rivers and death interested a little band of Shiftas that held out in the remote fastnesses of the mountains of Kaffa. Hard men were these mounted bandits, cruel criminals without even a vestige of culture such as occasionally leavens the activities of rogues, lessening their ruthlessness. Kaficho and Galla they were, the off-scourings of their tribes, outlaws, men with prices upon their heads. It was not raining now, and the rainy season was drawing to a close, for it was the middle of September. But there was still much water in the rivers, and the ground was soft after a recent rain. The Shiftas rode, seeking loot from wayfarer, caravan, or village; and as they rode, the unshod hoofs of their horses left a plain spoor that one might read upon the run. A short distance ahead of them, in the direction toward which they were riding, a hunting beast stalked its prey. The wind was blowing from it toward the approaching horsemen, and for this reason their scent spoor was not borne to its sensitive nostrils, nor did the soft ground give forth any sound beneath the feet of their walking mounts. Though the stalker did not resemble a beast of prey, such as the term connotes to the mind of man, he was one nevertheless, for in his natural haunts he filled his belly by the chase and by the chase alone. Neither did he resemble the mental picture that one might hold of a typical British lord, yet he was that, too—he was Tarzan of the Apes. 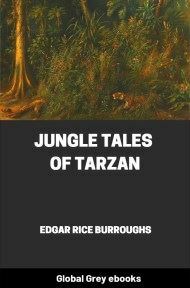 All beasts of prey find hunting poor during a rain, and Tarzan was no exception to the rule. It had rained for two days, and as a result Tarzan was hungry. A small buck was drinking in a stream fringed by bushes and tall reeds, and Tarzan was worming his way upon his belly through short grass to reach a position from which he might either charge or loose an arrow or cast a spear. He was not aware that a group of horsemen had reined in upon a gentle rise a short distance behind him where they sat in silence regarding him intently. Usha the wind, who carries scent, also carries sound. Today, Usha carried both the scent and the sound of the Shiftas away from the keen nostrils and ears of the ape-man. The circumstances that brought Tarzan northward into Kaffa are not a part of this story. Perhaps they were not urgent, for the Lord of the Jungle loves to roam remote fastnesses still unspoiled by the devastating hand of civilization, and needs but trifling incentive to do so. 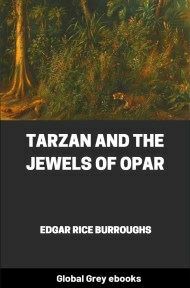 At the moment, however, Tarzan's mind was not occupied by thoughts of adventure. He did not know that it loomed threateningly behind him. His concern and his interest were centered upon the buck which he intended should satisfy the craving of his ravenous hunger. He crept cautiously forward. From behind, the white-robed Shiftas moved from the little rise where they had been watching him in silence, moved down toward him with spear and long-barreled matchlock. They were puzzled. Never before had they seen a white man like this one, but if curiosity was in their minds, there was only murder in their hearts. The buck raised his head occasionally to glance about him, wary, suspicious. When he did so, Tarzan froze into immobility. Suddenly the animal's gaze centered for an instant upon something in the direction of the ape-man; then it wheeled and bounded away. Instantly Tarzan glanced behind him, for he knew that it had not been he who had frightened his quarry, but something beyond and behind him that the alert eyes of Wappi had discovered. That quick glance revealed a half-dozen horsemen moving slowly toward him, told him what they were, and explained their purpose. Knowing that they were Shiftas, he knew that they came only to rob and kill—knew that here were enemies more ruthless than Numa. When they saw that he had discovered them, the horsemen broke into a gallop and bore down upon him, waving their weapons and shouting. They did not fire, evidently holding in contempt this primitively armed victim, but seemed to purpose riding him down and trampling him beneath the hoofs of their horses or impaling him upon their spears. 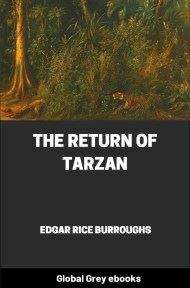 But Tarzan did not turn and run. He knew every possible avenue of escape within the radius of his vision for every danger that might reasonably be expected to confront him here, for it is the business of the creatures of the wild to know these things if they are to survive, and so he knew that there was no escape from mounted men by flight. But this knowledge threw him into no panic. Could the requirements of self-preservation have been best achieved by flight, he would have fled, but as they could not, he adopted the alternative quite as a matter of course—he stood to fight, ready to seize upon any fortuitous circumstance that might offer a chance to escape. Tall, magnificently proportioned, muscled more like Apollo than like Hercules, garbed only in a lion skin, he presented a splendid figure of primitive manhood that suggested more, perhaps, the demigod of the forest than it did man. Across his back hung his quiver of arrows and a light, short spear; the loose coils of his grass rope lay across one bronzed shoulder. 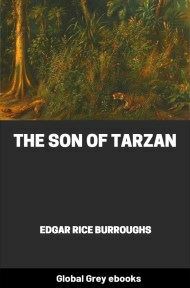 At his hip swung the hunting knife of his father, the knife that had given the boy-Tarzan the first suggestion of his coming supremacy over the other beasts of the jungle on that far-gone day when his youthful hand drove it into the heart of Bolgani the gorilla. In his left hand was his bow and between the fingers four extra arrows.